Earlier today I returned to my room in Qingyuan, Guangdong, just in time to avoid a thunderstorm. Later as I worked at my laptop, I turned to look outside. The rain had appeared to come at least nearly to its end, and there was an unusual type of sunny brightness. I wondered if this could be an opportunity to see a rainbow. On several recent occasions I thought I might catch one only to be disappointed each time. 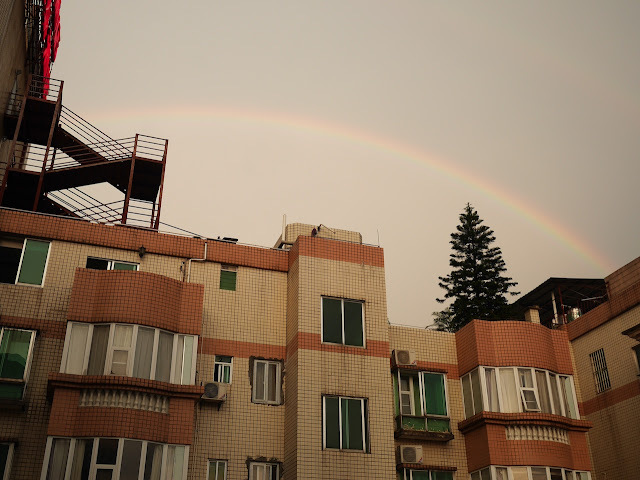 In fact, the last time I saw a rainbow in China was three years ago in Shaoyang, Hunan province. And four years ago after seeing a painted rainbow on a building in Hengyang, Hunan, I considered the fact that I couldn't remember having seen any real rainbows during my previous eight years in China. I later wondered whether the rarity with which I spotted them in comparison to when I lived in the U.S. could be at last partially connected to air pollution. The end of daylight was soon approaching, and I thought about where the sun would be at the moment. I realized that if there were a rainbow, my window was facing a favorable direction. So I took a look. I'll admit, seeing a rainbow outside led to a small gasp. After excitedly taking some photos, I raced outside. Well, the elevator wasn't in a hurry, but I did my best otherwise. I made a quick decision that heading to the Qiaobei Road Overpass, from where I took a previous photo shared here, would be my best bet. And from the pedestrian bridge, I took more photos. I had gotten there just in time. About 10 minutes later the rainbow was gone. And soon after that so was most of the sunlight. From the time I went out, the peculiar type of light when facing some particular directions wreaked havoc on my camera's white balancing. But I took effort to ensure the photos above are reasonably faithful to what I actually saw, which I prefer over taking some simple steps to make them more visually appealing to many people with a bluer sky. 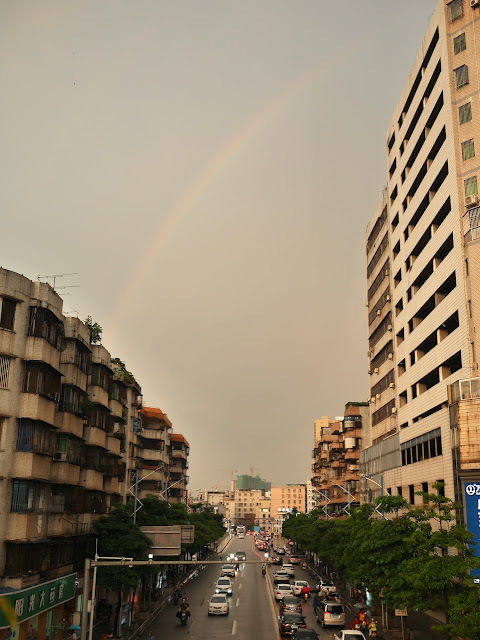 I later noticed faint signs of a double rainbow in the photos. It isn't easy to spot, but it's there. That might be a first for me in China. The rainbow (and these photos) won't win any awards, but it still greatly lifted my spirits (though not that high). And after I received puzzled looks from some passersby, once they figured out the target of my attention, sometimes with my help, they appeared to appreciate it as well — especially the little girl who had pointed out the foreigner to her mother. Hopefully it isn't another 3 years before I see another rainbow. Nice rainbows! We get quite a lot in Haikou, but I never get tired of the sight. Ah, another reason to visit to Hainan . . .